College Football Week 3: ABC’s Saturday Night Football: Ohio State-TCU is Highest-Rated Game of the Season on Any Network; ESPN and ABC Both Up 27% Year-Over-Year on Saturday - ESPN Press Room U.S.
College football’s week 3 netted impressive results for both ABC and ESPN, as ABC’s Saturday Night Football aired the highest-rated game of the season on any network and both networks were individually up 27% year-over-year on Saturday, Sept. 15. Led by SNF, ABC/ESPN combined to air four of the six highest-rated games across all networks while also generating year-over-year ratings increases in nearly every game window. ABC’s Saturday Night Football featuring Ohio State vs. TCU (8 p.m. ET) is the highest-rated game of the 2018 college football season across all networks, as the Buckeyes’ 40-28 victory delivered a 4.9 overnight — ABC’s highest rating for a regular season game in more than a calendar year (Oklahoma at Ohio State on Sept. 9, 2017). Season to date, ABC/ESPN now have aired three of the four highest-rated games across all networks. Leading the Way in Prime-Time: ABC outpaced the broadcast competition by 113% in prime-time. ABC SNF concluded a tripleheader which saw the network grow its audience in every single game window, as Oklahoma-Iowa State (noon) earned a 2.6 overnight, up 4% from last year, and BYU-Wisconsin (3:30 p.m.) earned a 2.1 overnight, up 24% from last year. The overnight for the Sooners’ victory was the third-highest overnight of the day among all networks. Alabama at Ole Miss (7 p.m.) earned a 2.2 overnight, cable’s second highest rated Saturday game of the season trailing only ESPN’s telecast of Clemson-Texas A&M in week 2 (3.0 overnight). 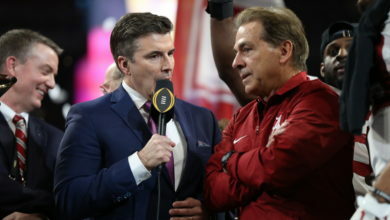 The overnight for the Crimson Tide’s impressive victory was up 57% year-over-year, and peaked early at 3.7 overnight as Alabama extended their lead in the first half (7:30-7:45 p.m.). Noon: ESPN and ESPN2 aired the two highest-rated games, beating the competition by 333% and 33%. ESPNU and ESPNEWS equaled the competition in that window.